Oxford is the oldest university in the English-speaking world. Brandeis University is excited to offer interested students the opportunity to spend a year studying at the University of Oxford in Oxford, England. In addition to benefiting from a rigorous and rewarding academic program, students will be able to further develop their intercultural skills on the historic campus of the oldest university in the English-speaking world. The University of Oxford is comprised of a number of colleges; students apply to a specific college rather than the University. Brandeis students will have the choice to directly enroll at one of four colleges within the University of Oxford system. Academics at Oxford are characterized by the tutorial system. Students typically take two tutorials (courses) per term, which generally meet once per week or once every two weeks. These meetings will be held one-on-one or in small groups with a tutor (professor). The tutorial system is best for students with a high level of discipline and a passion for indepdendent study, who are interested in delving more deeply into subjects of which they have a solid understanding. Although all of the Oxford colleges operate under the tutorial system, some colleges specialize in certain subjects. When choosing a college, it is important to consider not only the academic subjects available for visiting students, but the overall experience. The size of the college, its location within the city of Oxford, and the housing options available there are all things to think about when selecting a college. Learn more about the colleges below. To set up an advising appointment for Oxford, please call the Office of Study Abroad at 781-736-3483 to set up a time to speak with J. Scott Van Der Meid, Associate Dean of Study Abroad. The Brandeis Study Abroad Deadline for Oxford University is: Thursday, January 17, 2019. With a history dating back 800 years, Hertford’s academic excellence is framed by a commitment to fairness and opportunity. Through their deep focus on teaching and research, Hertford’s fellows and lecturers are world leaders in their fields. Among their notable alumni, Hertford can count Jonathan Swift, author of Gulliver’s Travels, World Wildlife Fund founder Gavin Maxwell, and former Prime Minister of Malta, Dom Mintoff. A shared sense of community between staff and students creates a welcoming learning environment for students. 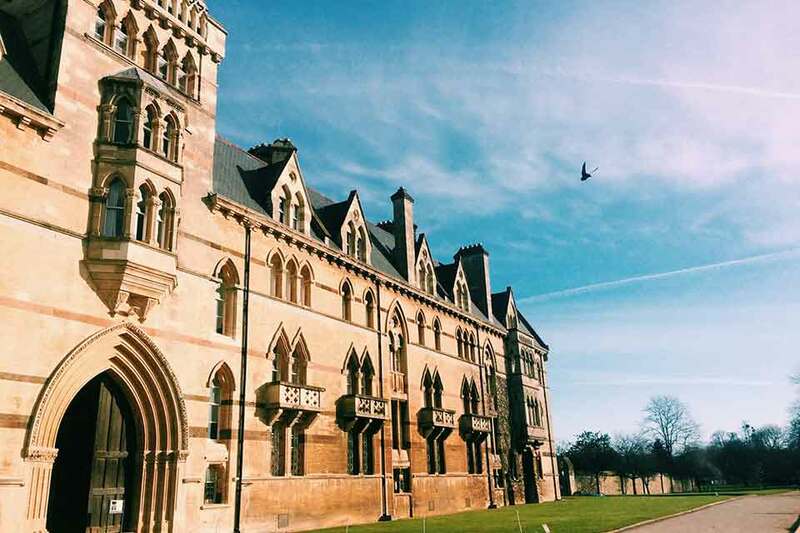 Founded in 1962 on an ethos of high academic standards combined with an independent streak, St. Catherine's College is the University of Oxford's newest and largest mixed college. The college offers a wide range of subjects, with the study of science and arts represented in equal measure. With its modern buildings and restful, open spaces, St. Catherine's has a friendly and relaxed atmosphere, while remaining vibrant and dynamic. Many alumni of St. Catherine's have gone on to accomplish great things, such as 1975 Nobel Prize winner for Chemistry Sir John Cornforth, critically acclaimed and award-winning photographer Jason Bell, and the author of Catch-22, Joseph Heller. Dating back as far as the 1190s when St. Edmund of Abingdon taught in a house on the site of the last surviving educational medieval hall that predated the University of Oxford, St. Edmund Hall was chartered as a college in 1957. At St. Edmund Hall, your academic development will be fostered by the highest expectations of your studies, support for your welfare, and encouragement of your creativity. St. Edmund Hall encourages intellectual curiosity and debate, adventurousness, and the exchange of ideas between disciplines. St. Edmund Hall's alumni have achieved great success in varied fields, which include CEO of Arsenal Football Club, Ivan Gazidis, and Senior Vice President of eBay Europe, Douglas McCallum. With its founding by Bishop Francis James Chavasse and his son Christopher Maude Chavasse, St. Peter's Hall was established in 1929 with 40 students. In 1961, with 250 students, St. Peter's completed the process to full collegiate status. An intimate setting buzzing with energy and creativity, St. Peter's believes in academic excellence and places great emphasis on teaching and research. The college can boast of many exceptional alumni, such as Norman Smith, the Chief Political Correspondent for BBC News; Emmy-nominated actor Hugh Dancy, who has appeared in many films, including Black Hawk Down; and the Revered Wilbert Awdry, creator of Thomas the Tank Engine. For applicants who are not from an English speaking majority country or have not been solely educated in English throughout the past two years at the time of application (educated in English for 2 years by January deadline), we are required by the Home Office and Oxford University to assess your English language ability. All teaching at Oxford University is carried out in English (with the exception of some language-specific teaching) and tutors must be convinced that you have sufficient fluency in written and spoken English to cope with your course from the start. Therefore, the University of Oxford requires the following from a non-native English-speaking applicant: IELTS: overall score of 7.5 (with at least 7.0 in each of the four components) or TOEFL (internet-based): overall score of 110 with component scores of at least: Listening 22, Reading 24, Speaking 25, and Writing 24. For more information, please visit the University of Oxford's English language requirements website. Please note that Abroad101.com is not a Brandeis sponsored website, but is an independent website that publishes student reviews of study abroad programs around the world.